Thermal imaging is a low cost, effective method of protecting your business’s assets and giving you peace of mind. It is an essential part of every commercial and industrial business’s preventative maintenance plan. Specialised and highly sensitive equipment is used by a skilled technician to identify equipment faults that are not visible to the naked eye. The thermal images are accurate to one tenth of a degree and will show if any components such as electrical switches are too hot. While electrical problems are often the primary focus of Thermal imaging, it can also be used to check mechanical equipment to determine if it is running too hot – bearings, for example. 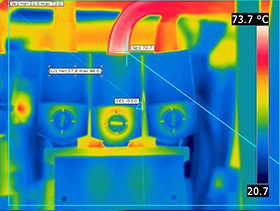 At the other end of the scale, Thermal imaging can detect cold air loss in refrigeration systems. Thermal imaging is a non-intrusive preventative maintenance activity that can be, and is best done, when your business is in full operation. A Thermal imaging inspection is a very effective way of highlighting deficiencies in equipment that would not otherwise be apparent. It can pinpoint the exact location of faults and allow componentry to be replaced before a problem occurs. Without this service, unidentified equipment faults can lead to equipment failure, loss in electricity supply or electrical fire. It is often recommended by insurance companies that Thermal imaging is undertaken on an annual basis to reduce risk. Thermal imaging should be one of the critical maintenance tasks carried out on a regular basis across your facilities to ensure up to date assessment of the safety and efficiency of your business’s equipment. 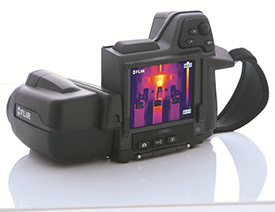 HOW DOES THERMAL IMAGING HELP YOUR BUSINESS? This switchboard is located in a tenancy and is a perfect example of why property managers & owners should consider Thermography as a useful tool not just for checking electrical infrastructure, but for many other applications whereby the naked eye needs extra help. As always, the technology is ONLY AS GOOD AS THE PERSON BEHIND THE CAMERA. You would not ask a plumber to service your car would you? Of course not! 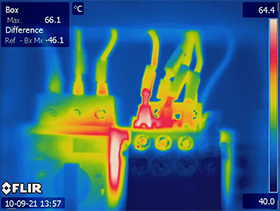 That is why reputable companies employ licenced electricians to perform electrical thermography. It is also important to utilize an independent service provider; you need the peace of mind to know that the company you entrust is going to provide the service in a professional and unbiased manner. There is an obvious conflict of interest in any business performing the diagnosis and then undertaking the “do and charge” work to remedy faults. When deciding how to spend your maintenance dollar, choose Thermoscan® Inspection Services Pty Ltd and you can be assured of the best value independent service.